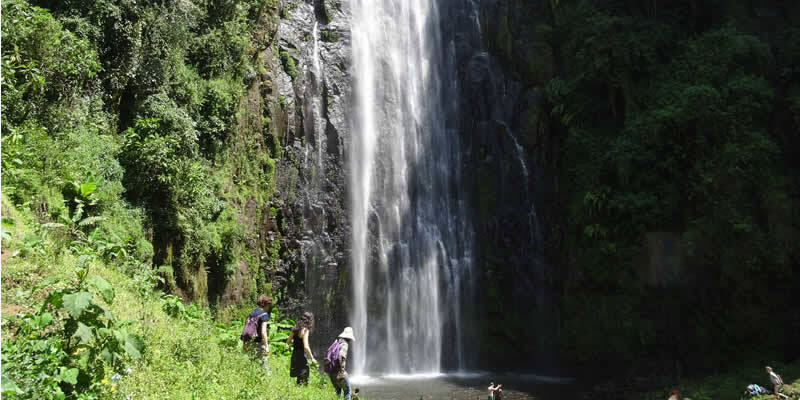 If you had a free day in Moshi and you want to unwind walking away from the bustle of the city then the excursion to the waterfall Materuni is what you need! You will move to a small village that takes you about 30-40 minutes, and it will be the start of a journey when you will meet a marvelous nature of Kilimanjaro. Leaving behind a modest village, you will come to a small trail extending through the rain forest and coffee plantations will lead you straight to the waterfall. Along the way, the guide will show how avocado, mango, eucalyptus grow and try to find the little chameleon which are not uncommon in these coffee regions. When you reach your goal, you’ll get a wonderful views of the waterfall of 50 m heigh, and if the weather permits, you will be able to pleasantly refresh under its water flows. After the walk, you will return to the village, through the already known route, where you will find coffee ceremony with traditional dances and songs, you will also be offered to participate and try to make yourself some coffee authentic method. You will depart your hotel at around 08:00am and head to the Materuni village. While at the village you will get to explore the lives of the Chagga people and do a coffee tour to see how the locals grow and brew coffee. After the coffee tour you will head to the waterfalls where you will have your packed lunch and spend the rest of the afternoon. Afterwards you will be transferred back to your hotel in Moshi.